NOTES:1. Read instructions all the way through before beginning. 2. 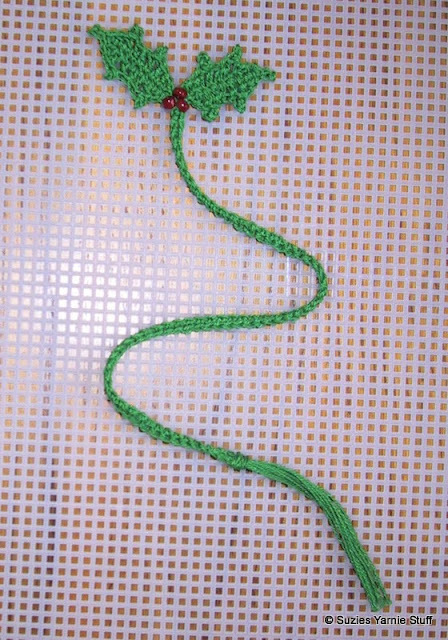 Leaves and berries maybe worked with any size yarn or thread just use the appropriate size hook for the yarn. Ch 10, sc in 2nd ch from hook, *hdc in next ch, dc in next ch, picot, dc in next ch, hdc in next ch, dc in next ch, picot, dc in next ch, hdc in next ch*, sc in last ch, picot, sc in same st. Working in the unused loops of foundation ch and over the tail, repeat from * to *, sc in last ch, slipstitch in first sc. Ch 69, sc in 10th ch from hook, to form ring. Sc in each chain, slipstitch in same st as first ch. DO NOT fasten off. Ch 12, slipstitch in 3rd ch from hook, sc in next ch, hdc in next ch, dc in next ch, picot, dc in next ch, hdc in next ch, dc in next ch, picot, dc in next ch, hdc in next ch*, sc in last ch, ch 1. Working in the unused loops of foundation ch sc in first ch, hdc in next ch, dc in next ch, picot, dc in next ch, hdc in next ch, dc in next ch, picot, dc in next ch, hdc in next ch*, sc in last ch, slipstitch in first sc. Cut 6 strands of thread about 6 inches long. Fold in half and draw loop through the circle at end of tail with a crochet hook. Draw the loose ends of the strands through the loop and pull them down tightly to form a knot. Trim ends of tassel evenly. Glue three red seed beads to base of leaves. As an alternative make the berries with French knots of red thread. Oh, that is such a pretty one. And I am sure the leaf could be used with other flowers too.